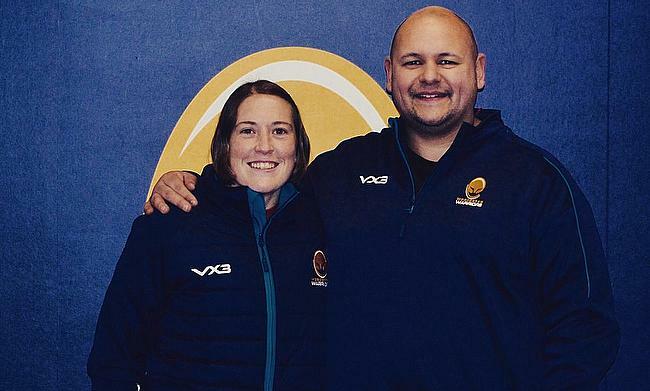 After two and a half years with Gloucester-Hartpury, Rich Whincup was recently announced as the Worcester Valkyries’ kicking coach. Joe Harvey spoke to the 38-year-old about his coaching philosophy and the personal obstacles he has dealt with. “I’ve been on the McGuire Programme since I was 19," began Rich Whincup. "Beforehand, I’d always found quiet corners in the changing rooms, listened to the humorous discussions that went on, but without joining in, because I couldn’t get a lot of words out. Whincup quickly rose through the ranks at the McGuire Programme (a stammering treatment programme/course run for people who stammer by people who stammer) and became an instructor at a young age. This year will mark the 20th year in his association with the organisation and some may even know Whincup from his role on the Channel 4 documentary ‘Stammer School: Musharaf Finds his Voice’, where the coach taught Educating Yorkshire star Musharaf Asghar the same speech techniques that changed his life. Another well-known former student of Whincup’s is former Saracens player, Kelly Brown: “He did his course whilst he was captaining Scotland. It was a busy time for him and then he has moved forward with his speech. Now he’s the Academy coach at Saracens. Whincup had always played rugby, starting out as a five-year-old at Stow-on-the-Wold Rugby Club and he went on to play for Camp Hill in Solihull and Cirencester, with a brief spell at Birmingham Moseley in between. But, after moving to London, Whincup became a casual observer of the game he had played for much of his life. It wasn’t until after having his first child in 2006 that Whincup considered returning to the game; “I remember saying to my wife, ‘wouldn’t it be great if he played rugby and maybe I could coach him?’. When he was five there was the opportunity for me and him to join Tewkesbury and when he played with the U7s, I took that team on. “I’d always kicked as a player and I’d always admired the way that Dave Alred went about his business. A few parents asked me if I could coach their children. I did some kicking sessions and it went really well. Whincup went on to approach Gloucester-Hartpury to offer his services as a specialist kicking coach and after enjoying two and a half years with the club, he took the decision to leave the set-up after being impressed by the player-centric focus of the Worcester Valkyries. I am thrilled to be joining the @WorcsValkyries as Kicking Coach. It’s a new chapter in my coaching career. Thanks again to Gloucester-Hartpury for a great 2 and half years, but it’s onwards to a new challenge. Worcester currently prop up the Tyrrell’s Premier 15s table with four points, but Whincup is hopeful that his coaching will be able to add a different dimension to the Valkyries’ game that could change their fortunes. “Where the points are on offer, we just need to make sure that we take them. Where I can hopefully galvanise things is around kicking to space and focusing on some of those finer motor skills, hopefully that will go into match scenarios. But that’s the challenge isn’t it? “We’re all working hard to get those points up as much as we can. So, wherever I can help with that, I jolly well will!”. Whincup will be reuniting with former Gloucester-Hartpury player, Megan Goddard, who was also part of the inaugural female Barbarians side last year. With the women’s game now reaching professionalisation, Whincup believes that the need for specialist coaches, like himself, will be increasingly required. As well as being a kicking coach for the Valkyries, Whincup holds several other roles. He is a consultant kicking coach with the Swedish national teams, McGuire Programme instructor, ambassador for the Duke of Edinburgh Award and a lecturer at Hartpury College, just to name a few.